Q: Is there a real threat to patients from RFI? A: Yes, under certain conditions. RF interference to devices such as ventilators, patient monitors, pacemakers, neonatal infant warmers, motorized wheelchairs, and anesthesia delivery equipment has been reported and documented. Effects of the interference varied from false and spurious alarm indications to unwanted mode and operational changes. In general, the presence/absence and amount of interference is a function of power and proximity. The higher the power and closer the RF source, the greater the interference. The strength of an RF field is inversely proportional to the square of the distance from its source, which means that when distance is doubled, the field is reduced to one-quarter. Q: Have HDSCS operations caused interference to hospital electronics? 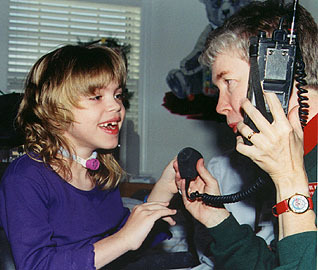 A: HDSCS members have operated 2-way radios in hospitals for over 35 years, not only for emergency communications, but also for North Pole Network at Christmastime (below right), where we have taken handi-talkies into patient rooms and used them next to pediatric patients as they talk to Santa Claus. We have had no serious interference problems. The worst so far has been tripping of IVAC alarms. (Only the alarms were affected, not IV delivery rate.) Of course, we have always been very careful to watch for any signs of RFI. We always have used the lowest transmit power possible consistent with maintaining communications. We don't transmit near infant warmers nor patients with pacemakers. 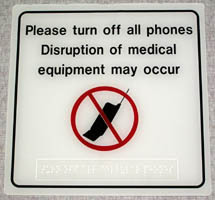 Q: Why do Orange County hospitals ban the use of cell phones but allow Amateur Radio operators to transmit there? Cell phones transmit intermittently whether a call is in progress or not, so that the cell sites will recognize the phone for incoming calls. The user is totally unaware when his phone is transmitting. There is no "transmit" light on a cell phone. Most cell phone users have no understanding of radio, radiation, and interference. They think of their device as a phone, not as a transmitter. They pay no attention to its potential for interference and in all likelihood they would not recognize RFI if it were to occur. Cell phones are more likely to get within inches of patient equipment than ham or hospital transceivers. Visualize Uncle Fred going into a hospital room to visit Aunt Minnie with a cell phone in his shirt pocket, leaning over to give her a peck on the cheek, and his cell phone touching the leads on her cardiac monitor. Hospital personnel are normally present when hams use their equipment on special occasions for emergency communications or North Pole Network, but they typically are not present on a day-to-day basis when a visitor whips out his phone to make a call. Hospital personnel can readily see us using our radios, but they have no way of knowing which visitors have cell phones turned on in their pockets. Another point to consider is that cell phones are not essential communications devices for doctors and other hospital personnel (unless there is a failure of the hospital phone system, of course). There are plenty of available Spectralink and PBX phones all over the hospital. Incoming messages to roving staff are adequately handled by pagers and Spectralink. Thus hospital administrators do not perceive any significant inconvenience or productivity detriment resulting from the banning of cell phones. Q: Shouldn't hospital equipment manufacturers completely shield their equipment from interference? A: Improvements in shielding and filtering should be done, and they are, but perfect shielding would be a nearly impossible task. For example, many types of patient monitors must have several long dangling leads that can inadvertently act as antennas. The biomedical voltages being sensed by the monitors are very small compared to RF voltages that could be induced in the leads by nearby transmitters. Every patient's setup is different, because the leads hang in different geometries. The lead geometry changes from minute to minute as the patient moves around. Some geometries may facilitate interference from nearby transmissions, others not. No manufacturer could do sufficient testing to insure that interference could not take place regardless of how the monitors/leads are set up and used. Q: Shouldn't the burden be on the hospital administration to replace faulty equipment and insure that new equipment was not too sensitive to RF frequencies in common use? A: I'll answer that question with two other questions: How can a hospital know what equipment is "faulty" or "too sensitive" without explicit specifications and compliance standards for manufacturers, which don't exist? How could the expense of replacing functioning-but-susceptible biomedical equipment be justified in today's cost-cutting environment, when the only perceived benefit would be visitor/employee convenience in being able to use their cell phones? Q: Couldn't hospital equipment receive interference from outside the hospital? A: Yes, if the incoming signal is strong enough. Television broadcast transmitters have disrupted the operation of wireless patient monitoring systems in several hospitals. Sudden unintended motion of powered wheelchairs has been blamed on two-way radio transmissions from vehicles just outside a hospital. Q: So this problem could occur outside the hospital, too? A: Yes. For instance, some cardiac patients must attach electrodes to send periodic EKGs from home to their doctor. If they live close to a broadcast transmitter, the EKG data can become garbled. But hospitals have a special responsibility because they are responsible for the health and safety of their patients, who often are in no condition to watch out for RFI problems for themselves. Q: What about the converse -- interference from hospital equipment to ham communications? When on station, put hand-held transceivers out in the clear, not worn on the belt. Observe the S-meter and move the radio to minimize received interference. Use UHF (222 or 440 MHz) bands instead of two meters (146 MHz) for internal communications. Computer interference is much less of a problem on UHF. In the Photo above right: Most of the time, HDSCS members have communicated from Command Posts and other non-patient areas. But during North Pole Network, we have gone directly into patient rooms, carefully watching for any RF interference. Copyright © 2008 Joseph D. Moell. All rights reserved.